Model AMT Dewpoint Hygrometer is a two wire 4-20mA loop powered transmitter, used for continuous measurement of humidity in a process gas or compressed air, which will output a linear 4-20mA signal corresponding to the dewpoint temperature. The Model AMT transmitter can also be factory configured to output a 4-20mA linear signal for any other moisture unit e.g. ppm(v), ppm(w), g/m3, lb/MMSCF etc. The Ultra High Capacitance sensing element is long lasting and offers excellent sensitivity, repeatability and response speed. Each unit is supplied with a Certificate of Calibration, traceable to International Humidity Standards, validating accuracy to ±2ºC dewpoint. The transmitter also incorporates an Automatic Calibration (AUTOCAL) feature, which allows the user to carry out a field calibration / span check. The AUTOCAL feature is operated by means of two small button switches built within the transmitter enclosure. To avoid tamper, the switches are locked in normal use and can only be activated by following a special routine. The integral RISC microprocessor circuitry of the Model AMT transmitter allows high resolution with advanced selfdiagnostics for fault conditions. It also enables periodic re-calibration of the moisture sensor, storing calibration data within the fully self contained unit. Loop powered by a 7V to 28V dc source, the Model AMT transmitter will provide a linear 4-20mA signal over the chosen range. The mechanics of the Model AMT transmitter have been designed to cope with extreme environmental conditions. The rugged stainless steel construction offers protection to IP66 (NEMA4X), with the transmitter electrical connections made via a secure industrial connector. Model AMT transmitter can withstand 35,000 kPa (350bar) maximum pressure and by employing a low resistance cable, the transmitter can be located at significant distances, in excess of 1000 metres, from the control room. 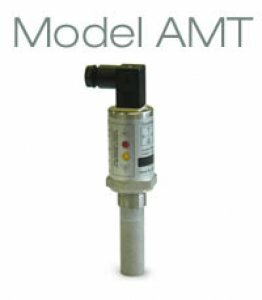 Designed with the operator in mind, for reliable and accurate measurements, the Model AMT transmitter is extremely easy to install and operate, requiring little or no maintenance. The Model AMT transmitter is supplied with a Certificate of Calibration, an instruction manual and 2m connecting cable.